Prashant Kumar from Muzaffarnagar, B.E. - B.Tech Graduate. MS OFFICE MS EXCEL ADOBE PHOTOSHOP MS POWER POINT TY-PING ENG - 50 HINDI & ENGLISH HINDI CONTENT WRITE.. HINDI AND ENGLISH TY..
are one of expert skill area's of Prashant Kumar . 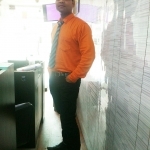 Prashant Kumar is working in Human Resources industry.